"41CP12, Burial 2, Pot 6" by Timothy K. Perttula and Robert Z. Selden Jr.
DECORATION: There is an engraved scroll and circle motif repeated four times around the rim. The central circle element has a small centrally-placed engraved circle within it. Ripley Engraved, var. 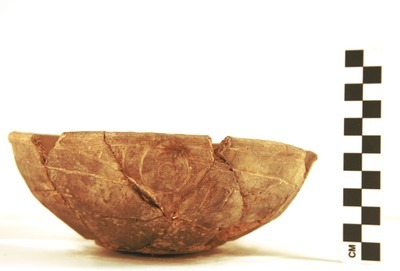 Galt carinated bowl, Burial 2, Pot 6.